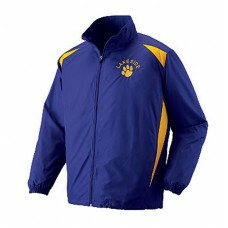 Shop4Teams is your online go to superstore for adult warm up jackets and warm up pants in a variety of colors and styles. We offer teams discounted prices and the friendliest customer service around. With games in all types of weather coaches and players need warmup jackets to protect them from the elements and keep their players’ muscles limber. Size chart carbon heather interlock bodyreverse mesh sleeve and backraglan sleeve with cuffgrap.. Size chart white wrap-around sleeve insertsgraphite reinforced necktapewhite matching 9" zipper.. Size chart space dye lightweight performance interlocklaser-cut graphite on sleeve and backgrap.. Size chart Sof-tec Ultra™ is a polyester/spandex with a sueded surface for unbelievable c.. Size chart Micro-Cord™ is a woven polyester fabric with a raised, ribbed texture and athl.. Size chart Hybrid design, wind/water-resistant Aero-Tec™ upper body. Warmth with th..